Shore Lunch breading/batter mixes are shere the journey to outdoor flavor begins. 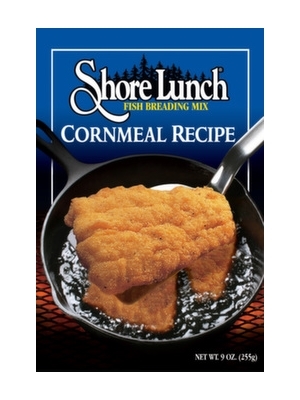 Shore Lunch Cornmeal Recipe Breading is inspired by a classic recipe and offers delicate flavor and crunchy textures. Preheat oil to 350 degrees. Place dry batter mix and egg or milk into shallow bowls. Dredge in egg or milk and then immediately dredge in dry batter mix. Place in preheated oil. Fry each side until done about 2-3 minutes, turning once. Fish is done when it flakes easily with a fork. Remove fish from oil and drain on paper towels. Enriched white cornmeal (white corn niacin, reduced iron, thiamine mononitrate, riboflavin, folic acid), degerminated yellow cornmeal, salt, bleached wheat flour, monosodium glutamate, spices, flavor (dried buttermilk, tapioca starch, natural flavor, lactic acid powder), paprika citric acid, flavor (sucrose, maltodexterin, natural flavors, soy lecithin, silicon dioxide).